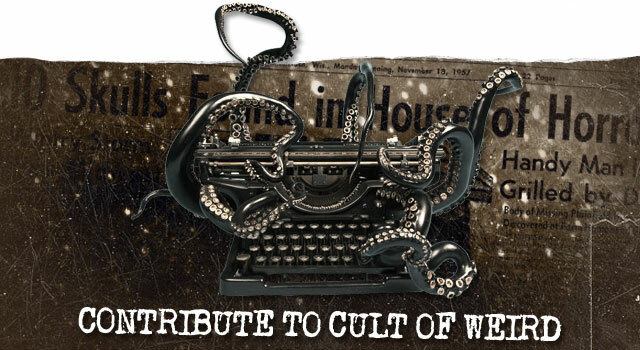 Cult of Weird is looking for knowledgeable writers interested in contributing to the growing catalog of oddities and obscurities. We welcome any and all Fortean topics in the form of non-fiction articles or short speculative fiction. We are currently not able to pay contributors, but links, author info and other promotional information can be included. Modern artists whose work is strange, dark, whimsical, etc. If you are not sure about your article contact us with details to find out if it is right for Cult of Weird. Reviews of film, documentaries, TV series, books, podcasts and other media dealing with any of the above subject matter are welcomed. 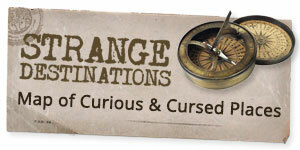 Cult of Weird is looking for entertaining and enlightening interviews with modern performers, artists, filmmakers, authors, researchers, oddities dealers and other unique personalities involved with any of the above subject matter. Facts should be well-researched and accurate to the best of your knowledge. Include sources where applicable. Edit! Articles should have proper formatting, grammar and punctuation. Specify the proper category for your article (e.g. Occult, Sideshow, Art, etc.) or suggest a new one. Articles should include at least one hi-res, relevant image that you have permission to use, own the copyright to, or is in the public domain. Author info: Include a brief bio with preferred public contact info, including email address and links to your website, blog, social media profiles, etc. Author photo: Include a portrait, quality photo or illustration of yourself. By submitting an article you are granting full rights and permissions to Cult of Weird to publish your article (in full or excerpt), photos and contact info on cultofweird.com and related social media platforms, including but not limited to Facebook, Twitter, Tumblr, Pinterest and Instagram.